Earlier, in late October, two Georgia men were arrested in connection with an alleged domestic terror plot to travel nearly 3,500 miles to a former military research facility in Alaska that they believed manipulates the weather, controls minds and traps souls. Michael Mancil, 30, and James Dryden Jr., 22, both of Douglas, Ga., had amassed an arsenal — including AR-15 military-style assault rifles, four Glock handguns, a rifle and more than 2,000 rounds of ammunition, radios and flak jackets — that authorities say they planned to use to attack Alaska’s High-Frequency Active Auroral Research Program (HAARP), a large radio transmitter cited in numerous antigovernment conspiracy theories. These two incidents, either of which could easily have ended in bloodshed, have one man in common: Internet personality Alex Jones, an influential and prolific conspiracy theorist who says the U.S. government was behind everything from the 1995 Oklahoma City bombing to the terrorist attacks of Sept. 11, 2001, including the massacres of schoolchildren at Columbine and Sandy Hook and the Boston Marathon bombing, and who claims that “Hillary Clinton has personally murdered and chopped up and raped” children. Seeds of violence: The unhinged claims spread by arch-conspiracy theorist Alex Jones might be amusing if they were not so dangerous. But that didn’t stop then-presidential candidate Donald Trump from going on Jones’ radio show, where he praised the “amazing” reputation of his interviewer. 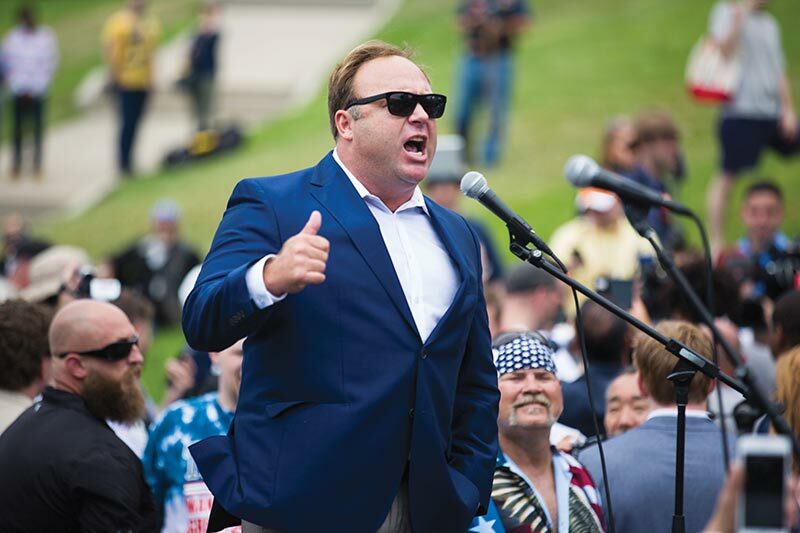 Jones, who has been spreading fake news and ginning up antigovernment hysteria for well over a decade, has recently gained new prominence through his connection to the Trump campaign. As a candidate, Donald Trump appeared on Jones’ show in December 2015, where he told Jones, “Your reputation is amazing. I will not let you down.” Jones claims to have personally advised Trump in the run-up to the election, and also asserted that a grateful Trump called him after his victory and promised to appear on the show again. That was before the fake news item known as “Pizzagate,” which was born on the Reddit and 4chan Internet forums and gained a dubious kind of credibility when Jones’ Infowars website began posting videos and articles pushing it, nearly ended in tragedy with Welch’s armed “investigation.” After an FBI complaint showed that Welch had been watching an Infowars “documentary” promoting the conspiracy theory, Jones scrubbed his site of most of its Pizzagate content in an apparent effort to distance himself from the fallout of this particularly toxic lie. His contrition, if that’s what it is, apparently ends with Pizzagate: Infowars still teems with grotesquely misleading headlines and conspiracy theories about vaccinations, a supposed Obama “scorched earth” policy, and a coup allegedly being plotted by Democrats.